If I’m going to brew a french press or want to make tea for more than just one or two, I turn to using a trusty stove top kettle to make the required amount. It’s quick and hasn’t let me down yet – although you do need to stay on top of it to watch when the water boils. This Variable Temperature Electric Kettle from Breville has some interesting advantages over the traditional stove top kettle. 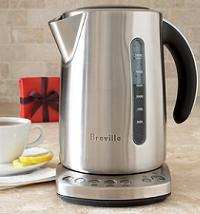 The Breville kettle does a lot more than just boil water. It allows you to quickly bring water to a preset temperature – and includes temperatures for green tea, white tea, oolong tea,black tea and French press, in addition to boiling – and will hold that same temperature for up to 20 minutes. The ‘hold’ feature is extremely convenient if you like to work or take care of things around the house while you’re waiting to make tea. There’s a safety shut off, in case you get too distracted and forget you left the kettle on. It holds 60-oz and has an easy to read water gauge on the side. The downside is that the Kettle is pricey – no surprise given all its features – but if you can find it on sale and know you’ll make good use of a new kettle, you can’t go too far wrong with this one.